Rochester, Minnesota … For many who bring family members to the world famous Mayo Clinic in Rochester, MN, the little church just minutes east of the clinic is recognized for its compassion for helping people in need. In fact as early as the 1950’s members of the congregation were assisting families who arrived in Rochester with seriously ill friends or family members, with housing and other assistance. By 1977 the congregation formed a 501c3 in order to formally obtain housing and offer assistance to the many visitors who came to Mayo, and needed housing while their family members were receiving medical care. The program was called, Hands of Compassion and a full-time minister was added to assist the families. In 1985 a six-bedroom house was purchased, and aptly named House of Compassion. In August 2007 a second six-bedroom house was added. One could easily conclude this large and successful outreach fully occupies the resources of this congregation of approximately 100 people. In reality, this is a long way from the truth. In addition to this ministry that is much larger than one would conclude possible, this congregation has an outward focus well beyond its size. An example of the heart of the congregation is seen in a member who came to Rochester to support a granddaughter who was receiving treatment at Mayo. Her name is Glendora Davidson (Glen for those who know her), and she is also known as the quilt lady. Now Glen is reaching out to fourteen seriously ill children in Malawi with brand new hand-made quilts she has prepared for them. Because of the support of Glen, Frank, and the Rochester church, members of the Malawi Project’s Board of Directors will personally hand carry and deliver Glen’s handmade quilts to children in Malawi during an upcoming trip. 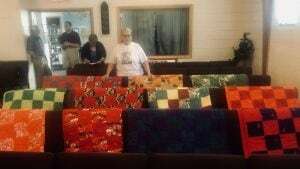 Glen can be seen standing behind a number of the quilts she has prepared for children in Malawi.